In every aspect of building a flintlock gun there are some parts that are simply not commercially available. Historically accurate sights for octagonal to round barrels are one such piece - so called "turtle" sights are overly large, but can be filed down for European arms, and there is a cast silver sight that is nicely proportioned, but quite small. I find it is the small custom parts that often set a piece apart from the rest. It's well worth it to take the time to make a part look authentic. Below is a description and photo tutorial for making a silver front sight for barrels with round muzzles. I use silver sheet from Rio-Grande, about .04" thick, but an old silver coin pounded thin will work as well. I use "easy" silver solder along with Stay-Silv flux, which melts at a low enough temperature for a standard propane torch to take care of. Cut out a piece of silver, wider at one end than the other by 1/8" to 3/16". Polish the face to remove any oils and mark the centerline. Using a hand vise with minimal teeth, clamp one half of the sight in the vise. Tap over one side until you have a sharp 90 degree angle. Use a borox based silver solder (also called silver brazing) flux to coat the inside of the angle. Fold the sight together and hammer tight - most of the brazing flux will shoot out, so make sure it doesn't get on anything important. Be sure there is no gap at the fold. Place the sight back in your hand vise (held by a bench vise), with the wide end a little lower to form the rear of the sight. Fold over both sides tight to the vise, then hammer to form a tight flat base. Don't worry about the small groove down the middle. We'll take care of that when we braze it. Take the sight in a needle nose or forceps, then lay a length of wire in the groove. Braze the sight together with a propane torch, using extra silver brazing wire to puddle in the groove. You can see the sight beginning to take shape. After the piece is brazed, place it in vinegar to soften the hardened flux, then place it back in the vise. Wedge a screwdriver on either side of the blade to pry up slightly the tabs, which we will now fit to the barrel. Draw your profile and base on the piece with sharpie, then file it. Use a file with the approximately the same radius as your barrel, then file the sight to fit. Be careful to keep the sight blade in line with the file, or you'll have a sight that wants to sit crooked on the barrel. If you puddled the silver wire correctly then the gap should disappear entirely. You can shape the sight blade at this stage, but it's easier to leave it rough and shape it once installed on your barrel. Though the photo is not shown, at this point I "tin" the sight by putting a thin coating of low-temp plumbing solder on the base - this makes it easier for the sight to bond with the barrel. Clean and degrease your barrel, then locate where you want the sight. In the image, I have wired the front barrel tab in order to prevent it from moving, should I accidentally use too much heat and melt the solder holding it in place. The brass is bent down and held at the breech with a clamp, making a spring to pin the sight to the barrel. Clean up the sight and shape the way you like. 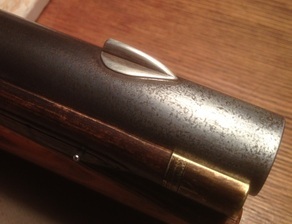 This pistol inspired by Kuntz and Rupp has a long and low blade that fares into the barrel at the nose. The base can be filed thinner and fared into the barrel. The braze joint should be invisible now as you file into it to shape the top of the blade.